Okay – so you’ve got a Google “penalty” – or something. You’re not getting as much traffic as you used to, you didn’t see any “manual actions” in Webmaster Tools, but still you want to know what’s going on. 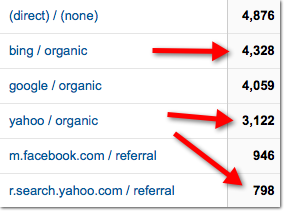 Figuring out what happened starts with looking at the available history in Google Analytics. Scanning this data, you can look for “significant” drops – places where the traffic seems to fall off a cliff, and significant increases, where it seems to climb up a cliff on the other side. Where you see a significant change, you can look up the dates when they occur, and try to match them up with major algorithm updates at Google. The problem with this approach is that you can actually MISS a lot of significant events that have affected your site. If you want to take a closer look, you can also just use these date ranges with a before and after comparison, and take a VERY close-up look at how your site was affected by each individual Google update event. As you can see, we use a 14-day time period for the comparison – 14 days prior, and 14 days after, because you tend to see these updates taking a couple days to roll out, and because we live on a round planet, today is sometimes tomorrow in another part of the world. This is just a short list – the good people at Moz have been maintaining a nice list of confirmed and suspected Google updates for some time now – not super important to go read that now, but a nice reference for when you have to dig deep to find answers. Anyway – I consider a 10-15% increase or decrease in Google traffic over a 2 week period to be significant. If you’re just not seeing that much change and there isn’t a long term trend starting on a particular date, then it could just be part of the ups and downs of search traffic, but you can switch to a 7-day range to get an even closer look. Use Annotations! 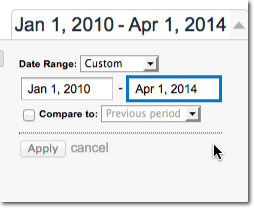 If you make big changes to your website – a new design, different checkout process, whatever it is – make an annotation in Analytics for that date, so when you look back later you can remember what happened. Now – let’s look at what you can DO about it, if you do have a problem resulting from one or more of Google’s numerous algorithm updates. Most of the time, you’d be right about that – but sometimes it’s not that simple. 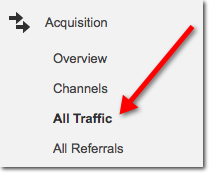 Let’s go back to that “All Traffic” report again… because we have something to consider here. All that bad black hat spamming you did was a big problem for Google, sure, but what about Bing and Yahoo? As we already saw, Google traffic took a dive on the first Penguin update a couple years back, and it hasn’t recovered. 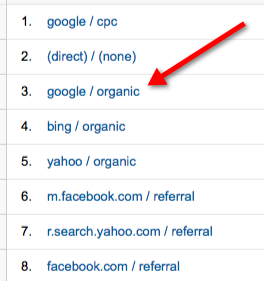 We can, of course, look at a Keywords report from back in 2012, and see what their top search terms were. Are they ranking for any of these on Google any longer? No – of course not – but they are getting SOME traffic from Google, which is a hallmark of the Penguin algorithm’s effects. I can’t show you their search terms, but let’s look at the dilemma they’re in. Google doesn’t love them as much any more, but Bing? Bing is freaking ecstatic about all the link spam that created this problem in Google. Bing can’t wait to send this site more traffic… and because of that, Yahoo also sends them a bunch of traffic. Can I advise them, in this case, to try to clean up the Google mess on this site? No, I can’t – Bing and Yahoo combined are worth a lot of revenue, and it is almost certain that doing any link removal for Google would hurt their rankings on Bing/Yahoo. Well, we are going to build a Disavow file for Google, which is a significant project in itself, and see if that has any effect at all, but if we don’t see significant improvement on those higher-volume search terms, we’re going to recommend that this client… build… an… entire… new… site… just for Google. Bing will still get the old site. Google will get the new site. No duplicate content. No redirects. Just a brand new site for Google to discover and crawl, with a different set of marketing processes that we know will work to drive traffic to the new site and start building Google organic traffic again. Once we get there, then we can redirect Bing to the new site, and everything will again be right in the world. I don’t like having to do this, but it is the logical decision from a business perspective. We can do the math on it. It makes sense. The alternatives don’t. But hey, whatever, I Blame Google™, and when it comes right down to it, our clients don’t hire us to do what sounds good. They hire us because they want the best advice. I’ve got a couple more posts coming in this series, so if you’re already on our email list you’ll hear about those. Scheduling an appointment to meet with us – we usually ask for a deposit but that’s waived right now so it’s 100% free. Answering the phone	(aka “showing up”) for your scheduled appointment – so we won’t regret waiving our usual deposit. Even if you believe you can do some of the work yourself, it pays to get expert advice. Hopefully your situation isn’t as weird as our new client’s turned out to be, but no matter what your situation is, we can help you get more organic traffic. That’s worth showing up for, right? 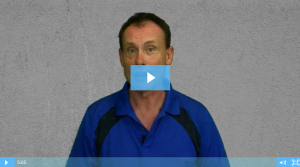 Double-P-S: If you’ve got a Google penalty – manual or algorithmic, you don’t have to figure this out on your own – you can schedule a free penalty assessment right now by clicking this link. Another important thing would be to ensure there weren’t any external changes that could have affected your traffic. Sometimes, I have seen significant drop in traffic after Google brought Knowledge Graph. Absolutely correct. Algorithmic “penalties” are far more difficult to diagnose. We use some specialized software we built internally to give use ‘hint’s for what to look for which we then use in conjunction with analytics and Webmaster tools. In general though, any 20% or larger drop in Google non-paid in less than 90 days is most likely – in today’s search environment – a targeted action by one of Google’s algorithms.